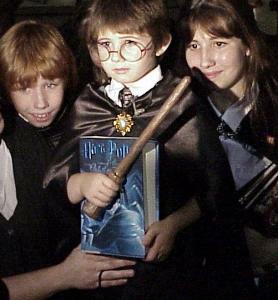 Harry Potter is one of the most popular characters in children's literature today, so it is only natural that Harry Potter costumes would be both popular and widely available. In fact, there are so many different costumes available, both for Harry himself and for various other characters in the books and movies, that it may be hard for you and your child to choose who you want to be, or which Harry costume to choose. The most popular character is, of course, the one for whom the books are named. There are several possibilities of costumes for Harry, the most common being his standard school uniform. In addition, his Quidditch robes are a popular choice. Since the release of the movie based on book 4, Harry Potter and the Goblet of Fire, costumes based on the clothes Harry wore for his three Triwizard Tournament tasks have also become popular. Toy stores have Harry Potter wands. The Noble Collection has a wonderful replica of Hermione Granger's Time Turner, as well as a large selection of replica wands for a more authentic look. Madame Malkin's Robes is an excellent resource, with descriptions of the various costumes, suggestions for making them yourself, and links to many sites with ready-made costumes. If your child wants to be Harry the Quidditch Seeker, simply change the shirt to black and the robes to red. A broomstick is necessary for this costume, and a Golden Snitch (a ping-pong ball painted gold and with two gold or yellow feathers glued on as "wings") will make this costume complete. 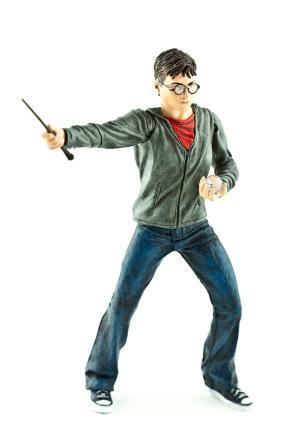 You could even use a small piece of wire to attach the "snitch" so it hovers just over Harry's shoulder. There are many people in the Harry Potter books and movies to choose from. A family could even choose to go as a group of Potter characters, with Dad as Albus Dumbledore, Mom as Minerva McGonagall, and kids as Harry and his friends. Other Hogwarts' students' costumes are fairly simple. For a more authentic look, there are a number of knit scarves and hats made in the colors of the various Hogwarts houses. These can do double duty as costume and as practical outerwear in cold weather. Some shops also offer house ties, again made in the colors of a given house and featuring the house crest. Specialized human characters, like Minerva McGonagall or Albus Dumbledore, it is probably best to go with a ready-made costume. For creatures like Nagini or the Basilisk, a basic snake costume could be used.